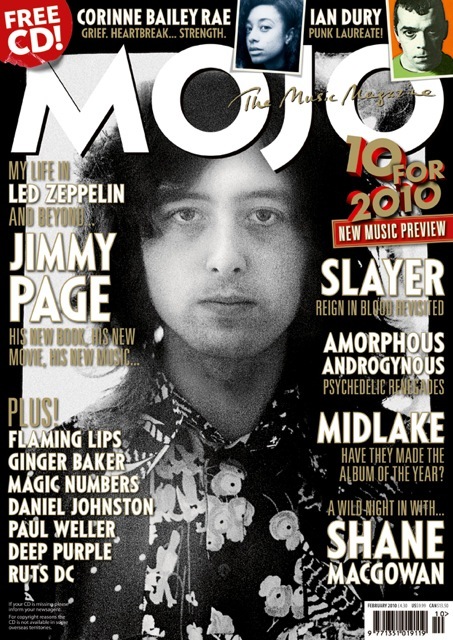 The new issue of Mojo has Jimmy Page as the cover subject – inside is an extensive eight page Jimmy Page interview in which he talks about his forthcoming pictorial book, the It Might Get Loud film, his new music and life in and out of Zeppelin. There’s also a fascinating seven page guide through Jimmy’s juke box faves accompanied by a series of photos taken by Ross Halfin at Jimmy’s home. There are also details about the compiling of his forthcoming pictorial memoir. Titled simply ”Jimmy Page” this 500 page limited edtiion deluxe book will be published via Genesis Publications in the spring. The Mojo piece previews several stunning unseen photos from it including a 1960s shot of Jimmy endorsing Selmer amps Gibson black beauty in hand and a photo of him sitting in a stream near Bron Yr Aur cottage in 1970. All in all this is an incredibly uplifting and optimistic portrayal of where Jimmy Page is at right now. After reading this, it had me wading through the man’s catalogue and marvelling at his craft again – you can expect to be doing the same. On the evidence of this inspiring interview, we will surely be hearing and seeing more of that craft in the future. And the book looks incredible…..
All in all a great way to start the year and celebrate Jimmy’s 66th birthday this coming Saturday.